One of my readers informed me that her sister saw Bellingham's Erie St. featured on national television and she lives in South Carolina. I went looking, on my bicycle. What a good way to see Christmas lights, by bicycle. Last time I did this in someone's car, the windows kept fogging up. Couldn't see much. Erie is in an area with lots of dead-end streets. Kind of hidden away and not that many people pass by. They went through a lot of work in that neighborhood. I wonder what the birds think. 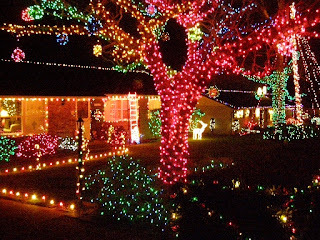 There are many lit up homes around Bellingham. I can enjoy them without having to do it myself. Some people worry about the energy used, but I wouldn't be surprised if it still takes more energy to heat the average American home.